It pleases Muwahhidden Publications to announce a three-day knowledge based seminar with the Noble Shaykh ‘Abdur Rahmaan al-Omaisan (May Allah Preserve Him). The Shaykh is a professor at the Islaamic University of Madinah, Saudi Arabia where he is currently completing his doctorate. He has studied for more than 16 years under the Noble Scholars of Islaam. His teachers include the Honourable Shaykh Muhammad Ibn Saalih al-‘Uthaymeen, the Honourable Shaykh Saalih al-Fawzaan, the Honourable Shaykh ‘Abdul Muhsin al-‘Abbad , the Honourable Shaykh ‘Abdullah al-‘Aqeel and many others. 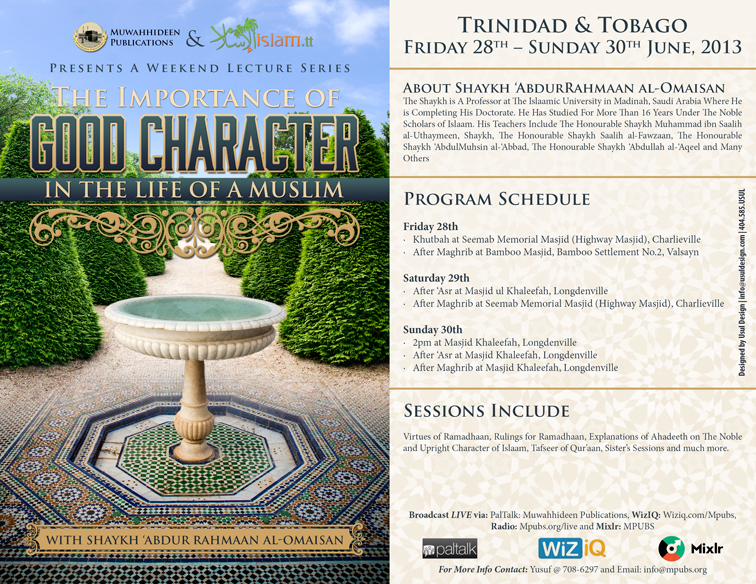 The Seminar, entitled, “The Importance of Good Character in the Life of a Muslim” commences on Friday 28th June and ends on Sunday 30th June 2013.